A storm sweeping across the south of Spain caused overnight flash flooding in the city of Malaga, where residents woke up on Sunday to survey the damages to infrastructure and property. Spain's weather agency, Aemet, said 153 liters of rain per square meter had fallen in the Andalusian city. Local emergency services reported over 200 incidents but confirmed that no-one had been killed or injured during the adverse weather conditions. They did report, however, an incident where a roof partially collapsed at an events arena during a concert. Malaga, which was founded by the Phoenicians, has steep city streets winding down towards the beachfront, making it susceptible to flash-flooding during times of heavy rain. 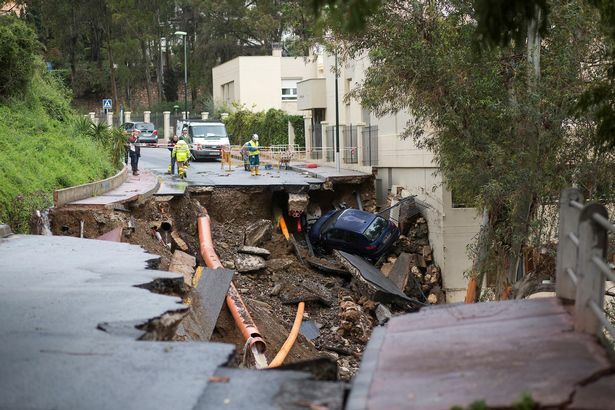 Part of a main road running perpendicular to the slope of one of Malaga's sheer hills was completely collapsed by the previous night's heavy water flow. One resident's car had tumbled into the hole left behind by the road and it remained sandwiched between slabs of tarmac and broken subterranean pipes when emergency services surveyed the damage the following morning. Residents in other neighborhoods found that their cars had been picked up by the floodwaters and moved down the street. Several buildings were inundated during the storm, included an older people's home, a refugee center, a medical complex and a local government department where witnesses said streams of water had broken through the lower floor windows. A museum near the city's port area was also flooded in the course of the night. Along with the heavy rain, the storm brought with it a spectacular electrical storm - at least 456 lightning strikes were recorded by meteorological officials in the region. Aemet maintained a yellow alert for adverse weather in the Malaga region, advising the public to "be aware." Malaga's location on the Costa del Sol makes it a popular tourist destination during the summer months.